This is amazing fabric - the ultimate cleaning cloth! These micro fiber cloths will change the way you clean forever. 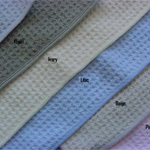 These premium quality Ultrafine Micro Fiber Cloths are made from a plush blend of 70% Polyester and 30% Polyamide. Non-abrasive and non-linting. A single strand of split ultrafine micro fiber is approximately 1/20th the diameter of a strand of silk or 200 times finer than a human hair. There are over 200,000 micro fibers per square inch of cloth. 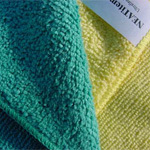 Our most popular Micro Fiber Terry cloth measures 40cm x 40cm (16" x 16"). That's a density of 45 million fibers in 1 cloth. These tiny micro fibers disperse oil, grease, dirt, grime, film, dust, and collect it deep in the cloth to be washed away down the drain. 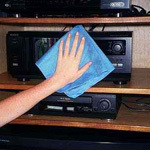 Re-used over and over, ultrafine micro fiber cloths usually last for years of use. Tough on dirt and gentle on surfaces. If you've been pricing micro fiber cloths on the Internet, at stores or through multi-level marketing, you know that prices on cloths can vary from $2.00 per cloth up to $20.00 per cloth. Of course some of these microfiber cloths are simply way over-priced, but many are different qualities of material (80/20 blend versus 70/30 blend, finished size, overall weight of fabric, etc.) It's like buying bath towels. You choose between the ultra plush bath towels like you'll find at the 5 star hotels or the see-through towels you'll find at the flea bag motel. We had an anonymous phone call recently on our voice mail claiming that she could buy our Ultrafine Micro Fiber cloth at her local store for $1.99. Well she was half right, I'm sure she did find a cloth for that price (maybe even less! ), but she wouldn't get the '5 star' cloth that we offer here at NEATitems.com. When you actually compare our cloths to any other cloths available, you'll see the difference in quality. If you don't agree, simply return them for a refund. BUT, if you would rather buy a less expensive cloth, check out our Micro Fiber Lightweight Cleaning Cloths for as little as $1.75 per cloth. 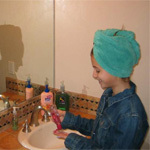 We carry many types of micro fiber: Our Terry cloths are great for all purpose cleaning, drying, dusting etc.... - our Ultra Suede Microfiber is great for delicate surfaces you don't want to scratch, great for camping and travel since they fold so compact... our Luxury of Reya towels are super plush and luxurious... you'll want to drown in them. And last but not least, our waffle weave micro fiber is a perfect medium for all uses... it's light, super absorbant... great for cleaning, bath towels, traveling... you name it!